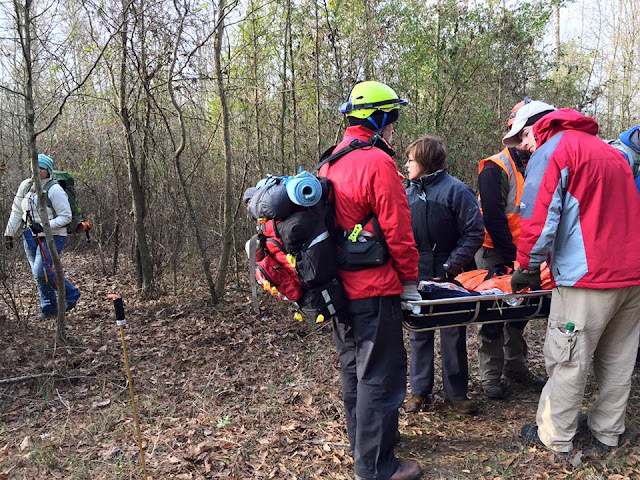 Over the last two weekends I participated with eleven other students in the 30 hour National Association of Search and Rescue (NASAR) SARTECH II Fundamentals class in Arkadelphia and Hope, Arkansas. The first weekend of training consisted of classroom instruction on wilderness survival, as well as, search and rescue organization, theory and practice. The second weekend was almost entirely in the field practicing theory and skills searching for a theoretical lost person in the thorny woods of central Arkansas. We were "called-out" to a deer hunting camp to look for lost female hunter that failed to return to camp. Looking for possible footprints we searched the base, performed a probability assessment of where the lost person might be and then formed "hasty search teams" to hunt for clues and signs. After finding footprints belonging to the person we tracked her trail step-by-step and found other clues down a dirt road on the way to a four way trail intersection. Since it was midnight when we arrived at the intersection and most of us were spent from a long day, we pitched camp to rest and resume the search at daybreak. After a wet, sub-freezing night we resumed the search following more clues suggesting that the possibly confused, disoriented, or ill person changed directions, doubled back on the trails. She was initially unresponsive to our auditory calls using her name. As we following her trail eventually getting closer to where she pulled off the trail for the night she responded to our signals. She was found just off the trail in the woods. After treatment for her deteriorated medical condition, she was carried out on a Stokes wire litter for transfer to a medical facility. Rescues typically take about 72 hours to resolve themselves. 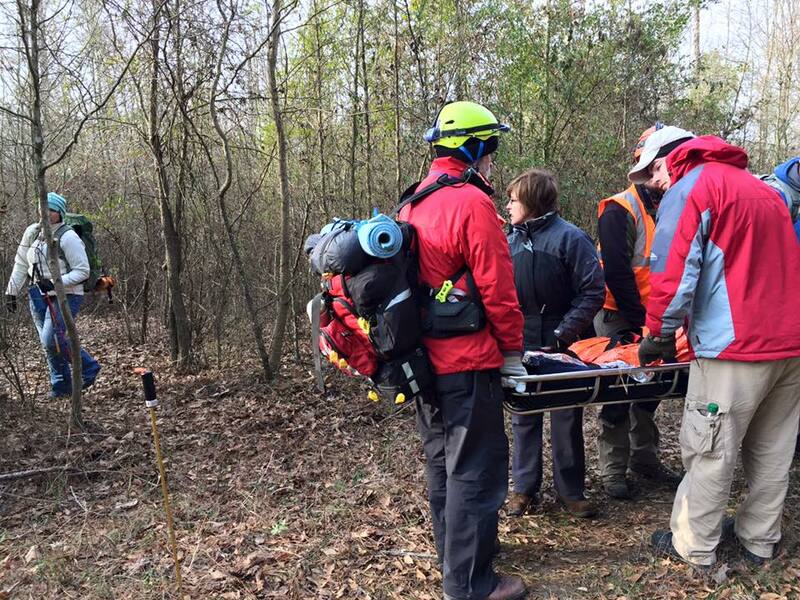 What we learned from the exercise was how to apply resources on most land-based search and rescues, how to organize a search and assume specific roles as leaders, searchers, and record keepers. Then to round out our appreciation for the subject the instructors added knowledge components about incident command structures, environmental hazards and first aid, land navigation & orienteering; ropes, knots and & standardized rescue equipment; and legal obligations of search and rescue personnel. Station #1: Land Navigation: Use of topographic maps and compass. Candidates complete a course over terrain commonly encountered in the operations area in a specified time frame, not to exceed 600 meters. Station #2: Tracking: Candidates identify and mark a footprint track left by the evaluator and follow the track to its end. Station #3: 24-hour Pack: Candidates should carry the basic survival and safety supplies for their environment and the items to complete the stations. Station #4: Rope Skills: Candidates demonstrate the ability to tie four basic knots and a harness with supplied rope and webbing. Station #5: Route Search: This station entails locating and labeling clues in a given area demonstrating the ability to detect 50% of the clues using a route search tactic. Station #6: Area Search: This station entails locating and labeling clues in a given area demonstrating the ability to detect 50% of the clues using an area search tactic. Training beyond these fundamentals is highly encouraged. Specializations include man tracking, K-9, mountain/technical rope, whitewater, avalanche, and underwater search and recovery. When I lived in southern Illinois I served briefly on the Williamson County Dive Recovery Team. I'll probably take further classes in the years ahead as the SAR subject is interesting to me on several levels. Navigation is becoming a lost art. As a right of passage in the 1950-60s I was a Webloe, Cub Scout, Boy Scout, and Explorer Scout (now called Venturing). I earned a lot of merit badges in outdoor skills. Technical and natural orienteering were two of them and we needed those skills to take solo trips in the lakes and woods of northern Minnesota where I spent much of my youth. Navigation is seemingly no longer relevant to most outdoor experiences. Cell phones, satellite phones, GPS, emergency locator beacons, and modern camping technologies have substantially reduced the fear of perishing in the wilderness for all but the unprepared and unfit. Even if we have technological tools to survive, the average modern human has lost its connection to the full outdoor experience. Few people can navigate by the wind, stars, moon, sun, or tides. Even fewer know how to use their five senses to learn from and understand the stories nature has to tell. Deep ecology is little understood by voters, let alone politicians and lawmakers. SAR is about saving lives or returning the remains of loved ones that perished in some unfortunate experience. Skills in providing shelter, providing nourishment and rendering medical care, plus transporting someone home to safety are the hallmarks of caring culture. You too could become a member of a rural or urban search and rescue team. There are lots of duties that can be performed at headquarters if you are not able or inclined to go into the field on a physical search.